The heritage field is a complex intersection of disciplines as varied as art history and geography, urban planning, conservation, education, geology, and nearly any other area of study one could imagine. 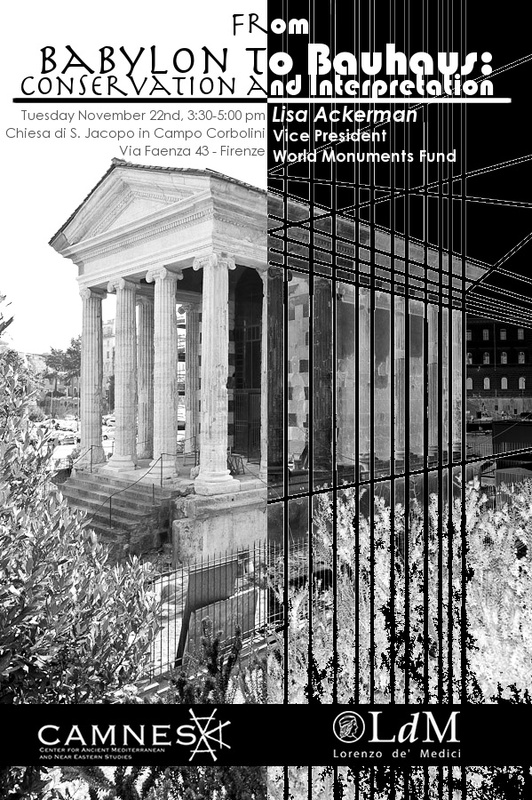 World Monuments Fund, like many other agencies engaged in conservation of historic sites, addresses the needs of projects that range from the creation of site management plans, conservation of ancient stone monuments, stabilization of earthen structures, to adapting buildings of the recent past for new uses. Since 1965, WMF has worked at more than 600 sites in more than 90 countries around the world. Through explanations of the work at current WMF project sites and presentation of the concepts expressed through the World Monuments Watch, this talk will provide an overview of work that engages local communities and heritage professionals in opportunities to conserve sites, improve stewardship, and increase public appreciation for the importance of these special places. Illustrated projects may include the Forum Boarium in Rome; Babylon in Iraq; Taos Pueblo in the United States; Ladakh in India; the Qianlong Garden in Beijing; and 20th century masterpieces by Paul Rudolph and Marcel Breuer.